We know little of Catherine other than stories which may have been embellished as the years go by. We believe she was of noble lineage and learned in science. She converted to Christianity after receiving a vision. When she was 18 years old, during the persecution of Maximinus, she debated with pagan philosophers. 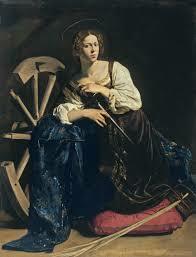 Many were converted by her arguments, and immediately martyred. Maximinus had Catherine scourged and imprisoned. The empress and the leader of the army of Maximinus were amazed by the stories and went to see Catherine in prison. They too were converted and were martyred. Maximinus ordered Catherine broken on the wheel. She was beheaded. Catherine was popular during the Middle Ages, there were many chapels and churches devoted to her throughout Western Europe.